Our fall meeting for 2014 will be held at Ramah Presbyterian Church in northern Mecklenburg County. This will be the first visit to Ramah in the fifty years of the Society. Located east of Huntersville, Ramah was one of the churches founded by Scotch-Irish settlers who migrated down the Great Wagon Road from Pennsylvania and settled in the wild backcountry of Mecklenburg in the mid-1700s. Ramah (pronounced Raymah) is one of the oldest Presbyterian churches in the area, and hosted services in a brush arbor prior to the building of the first log structure in 1783. 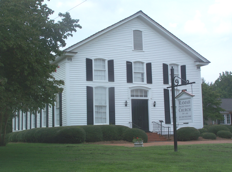 Records of Mecklenburg Presbytery show that the congregation was officially organized in 1795, and the congregation worshiped in the log Session House until 1820. A frame building was then constructed, which lasted until the present handsome church was built in 1881. In 1935 members of the congregation added a log building with a massive fieldstone fireplace, used for Bible classes and social functions. An educational building and fellowship hall were added in 1958. Of the approximately 500 headstones in the cemetery, ninety-two date from 1801 to 1861. The iron gate to the cemetery still stands, but the stones of the wall may have been crushed in the 1920s and used in the paving of Ramah Church Road. For over 200 years, Ramah Presbyterian Church has been at the core of a large farming community settled by the Scotch-Irish Presbyterians. What a fitting destination for the North Carolina Presbyterian Historical Society as we continue to celebrate our golden anniversary. Our Program Chairman Sam Martin surprised all of us at the spring meeting with an amazing gift – The First 50: The North Carolina Presbyterian Historical Society Yearbook, 1964-2014, compiled by Sam Martin. To produce this, Sam combed through the recordsof the society and created a visual and written record of each year of our existence. He traveled all over the state and into Virginia to produce his own photographs of every church we have visited in the past 50 years! The book begins with comments by our current president, Rev. John Goodman, and by Program Chairman Sam Martin; a report on the origin of our society written by Dr. Harold Dudley; and an article on the relationship of our society to the Synod of the Mid-Atlantic, written in 1988 by Dr. John MacLeod. The pages then give a look back at each year, with a list of the officers, location of the tour, the speaker, and photographs of the churches visited. The book ends with an alphabetical list of churches visited, with the year we were there. As Sam points out, however, the yearbook is a work in progress with numerous holes that need to be filled. It is in loose-leaf format for a reason. Anyone with information can contact Sam at (910) 428-4165) or email him at smartin8@embarqmail.com, or write to 222 Hunsucker Street, Biscoe, NC 27209. Sam very generously gave a yearbook to every individual or family at the spring meeting, and he is giving one to each presbytery in the state. We will also be sending them to former officers. If you were not at the spring meeting, come to the fall meeting to collect yours! Or if you simply can't come, ask Sam to send one to you. It will remind you of the interesting and beautiful churches we have visited, and will make you more aware of our strong heritage as North Carolina Presbyterians. In the virtually unanimous opinion of those attending the recent North American Symposium on John Knox, it was a stunning success. Held March 7-8 at Montreat, North Carolina, the symposium featured world-renowned speakers from Scotland, Canada, and the United States and was a gala event observing and celebrating the 500th anniversary of the birth of John Knox in 1514. North Carolina Presbyterians can take satisfaction that such a premiere event was held in their state. Co-sponsored by the Presbyterian Heritage Center at Montreat, the Montreat Conference Center, the Buechner Institute, King University in Bristol, Tenn., the North American Organization of Scottish Historians, the Montreat Scottish Society, and a number of foundations, it brought together an international array of speakers and panelists to consider the common heritage of the various denominations that make up the Presbyterian and Reformed family of churches. 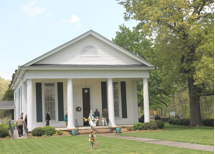 "We wanted to appeal to all branches of Presbyterians," commented Ron Vinson, Executive Director of the Presbyterian Heritage Center, "and we prepared for an attendance of 100. But we were astounded and gratified by the number of reservations which soared to over 200, and we found ourselves scrambling to accommodate all our guests." The two-day symposium opened with three keynote speakers who considered various aspects of the career and heritage of John Knox. Dr. Jane Dawson, Professor of Reformation Theology at the University of Edinburgh and author of a forthcoming biography of Knox, led off with personal reflections she has gleaned through her research on Knox. Then Dr. Ian Torrance, former President of Princeton Theological Seminary and now Pro-Chancellor at the University of Aberdeen in Scotland, spoke about aspects of Knox’s views on communion, and Reverend Dr. Erskine Clarke, former professor of American Religious History at Columbia Theological Seminary, explored the various strains of Reformed theology in the background of American Presbyterianism. The second day of the conference offered three concurrent discussion groups: one dealing with music in the Presbyterian tradition, another on aspects of Christian education, and a third providing more detailed considerations about the nature of the Scottish heritage. Leading these discussions were Michael Morgan, seminary musician at Columbia Theological Seminary, Martin Dotterweich, Associate Professor of History at King University, and a number of Canadian participants who held joint sessions with the North American Organization of Scottish Historians. A reception held at the Presbyterian Heritage Center and a banquet provided good opportunities for lively conversation and socializing among all those attending. Do your church records need to be preserved? Each year the Presbyterian Historical Society in Philadelphia makes grants of up to $500 to small congregations for the purpose of microfilming and digitizing their congregational records. The congregation must be at least 50 years old and have fewer than 250 members. Information about applying for a Heritage Microfilming Grant is at their website, www.history.pcusa.org, or call 215-627-1852. Applications are due annually on October 31. Our Spring Tour this year was also a celebration of the 50th birthday of our society, organized under the auspices of the Synod of North Carolina on April 10, 1964. Fittingly, the program looked to the future as well as the past. 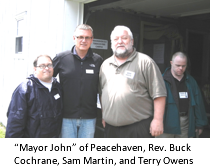 Our first stop was Peacehaven Community Farm, a new and flourishing ministry that connects adults with special needs with a whole community of peopleIts executive director is the Rev. Buck Cochrane, formerly at First Presbyterian, Greensboro. The 89-acre farm has plots of vegetables, an orchard, livestock, and 90-100 volunteers who work side-by-side with special needs adults to develop the farm and build the first of several planned homes for individuals with developmental disabilities. Our next stop was Bethel Presbyterian in McLeansville, established by Rev. Samuel Paisley of Alamance church in 1812. Eastern Guilford Co. was largely German Reformed (now part of UCC), and they shared a building for some time. The present frame sanctuary was built in1868, and there is a lovely cemetery. The old session house is now a fascinating museum full of historical items relating to the church. We then stopped at the Charlotte Hawkins Brown Historic Site in Sedalia. With the help of her benefactor Alice Palmer of Wellesley College, Dr. Brown established Palmer Memorial Institute, which became a nationally recognized preparatory school for African American students. We toured her former home, Canary Cottage, which also has displays about the institute's history. Then dinner together, a board meeting for some of us, and a good night's sleep! The next morning began at Springwood Presbyterian, established in 1868 when it broke with Brick Church (German Reformed) over either liquor or slavery (the stories vary!). Cut off on one side by I-85, the church is gaining members from a new housing development and retirement home nearby. Our final stop was First Presbyterian in Burlington, where we toured their beautiful church built in 1952. In 1857 Graham Presbyterian reached out to hold services in the Railway Hotel at Company Shops, and in 1869 the first building was a Union Church for 8 denominations. Company Shops became Burlington in 1887. Before lunch we met with our guests, Drs. Carole and George Troxler, retired from Elon Univ. and now members of our society. Carole has written the history of the Regulator Movement, Farming Dissenters: The Regulator Movement in Piedmont North Carolina, published by the NC Dept. of Cultural Resources. She gave a fascinating talk on the cultural background of the protestant dissenters in Scotland, Ireland, and the colonies, especially the Covenanter tradition. She then discussed the role of those dissenters in the Regulator Movement and the positions taken by various Presbyterian ministers during the War of Regulation in 1771, and the American Revolution a few years later. After an excellent barbecue and chicken lunch, our program chairman Sam Martin brought in a beautiful cake for our 50th birthday, and ice cream for all. We hoisted our banner, made a few years ago by Sylvia Weaver and Joy Heitmann. THEN CAME THE BIG SURPRISE! Sam Martin handed out to everyone copies of Our First 50: The North Carolina Historical Society Yearbook, 1964-2014, which he had compiled. It is a remarkable achievement and a much appreciated gift to all of us. From Interstate 77: Take Exit 25, NC 73 East (Sam Furr Road) from the Huntersville area. Drive 4.9 miles. Turn right on Ramah Church Road (one-half mile past the Davidson cutoff stoplight). The church will be .9 miles (nine-tenths) on your right; the cemetery is across the road from the church. The EconoLodge* in Cornelius has offered a discount for early birds who arrive on Friday night. Call them and tell them that you want the $59 group rate offered to the North Carolina Presbyterian Historical Society. Econo Lodge & Suites Lake Norman, 20740 Torrence Chapel Rd. (704) 892-3500. *CAUTION: The exit for the motel is Catawba Avenue in Cornelius. Major reconstruction at that junction is not scheduled to be finished until after our meeting, so allow probably 30 extra minutes to get to the motel. Please send form and check (payable to NCPHS) by Friday, October 10 to NCPHS, P.O. Box 20804, Raleigh, NC 27619-0804. If you have questions, please call our Program Chairman Sam Martin at (910) 428-4165.